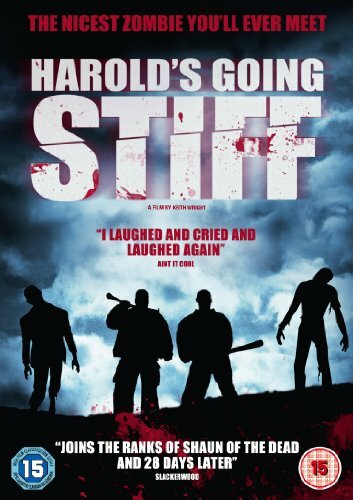 Watched @MrKeithWright's HAROLD'S GOING STIFF. This painful drama is an another good indie zombie flick from UK! Impressed! doctor: These are not dead people. These are ill people. They're people who need our help. Harold: I... Just wish I could... Go to sleep and... Not wake up. Harold: I haven't been able to do that for a long time. I... Actually touched my nose. doctor: Today we've had a breakthrough. Um, well, not just a breakthrough, probably the most important breakthrough we've had so far. We've been waiting for a while now before we could actually publish the results. We needed to make sure everything was correct. As you know, the first thing that you need to do before you can cure any disease is to find out what's causing it, and I think today we've, uh -- we've got a very good lead. Wh-what is that lead? Penny: Harold, what's your pants doing in the fridge? Harold: Jackson's point is about two miles away. We can go there one day and have a walk. Penny: I'm not really built for walking, though, Harold. Harold: Oh! Don't know. It should do you good. Penny: What do you mean? Harold: Well... Take some weight off you.